History: Built new as McCloud River Railroad outside framed boxcar #3029. The railroad converted the car to log flatcar #2325 in 1938. In July 1941, the McCloud Shops added a tank and fire pump to make fire car #1711. 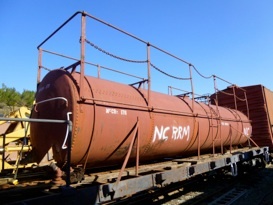 PLA purchased the car from the McCloud Railroad in 2012. Car was trucked from McCloud to Brightside on August 10, 2012. Car currently under restoration as a water car to support the steam program.